Quest Rewards and Dungeon runs are the only ways to significantly increase your character's Lvl. To make it more effective, always accept Quests before going into any Dungeons, this way, you can utilize your Battle Stamina Points, and avoid redoing incomplete quests. - [Gold]: In-game currency, needed for various things. - [Gears]: The available drops are shown in the battle preparation screen, check them here if you are looking for a certain gear, Tier and Grade drops increases as you progress through the game. - [Elements]. 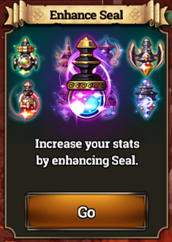 Elements are used to increase SEALS at Lvl 25+. - [EXP] = Earn to gain [3 Stat Points] and [1 Skill Point] Per Lvl Up. Dungeons are your main source of EXP but even better if you have a quest to complete. - Accept Quest: Use the [GO] button to enter the specific dungeon. - Tip: Always remember that you should always get a quest first before entering the dungeon, to avoid unnecessary dungeon runs. - Complete Quest: Redeem completion rewards, then repeat. - Aside from the dungeon related quests, you can also accept other in-game quests depending on your current Lvl, complete them to get more EXP and Gold. 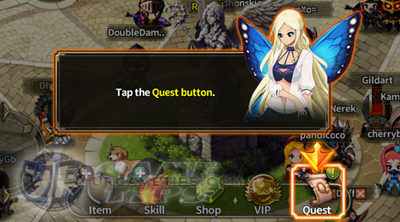 - As much as possible, always enter the Dungeon Stages via the Quest window ([GO] button). - Clear all monsters before entering the next map, however for the Boss Map, you may ignore the other monsters and kill the Boss right away if you want. - There is an exception here though, if your quest is to get a number of items from a specific monster, and you reached the Boss Map with an uncompleted quest, you might want to hunt more monsters that will drop the item first. - Your Character, Enemies, Summoned Friend, Portal Entries and the Boss. - This is pretty useful for range characters to get into a nice position. - Sweep Tickets are used to instantly complete a cleared stage. 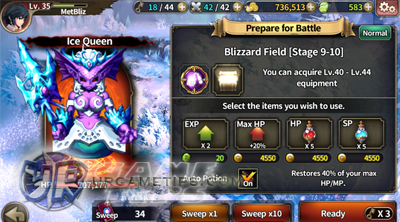 - Only use the [ Sweep x1 ] option though, if you are hunting items for a quest. - You can get more Sweep Tickets as freebies from various mission/login rewards, and more. When is the Best Time to Use Sweep Tickets? - Situation: You need to re-enter a cleared dungeon stage to complete a quest. - If the stage was too EASY, do not use Sweep. Just enter and complete the stage normally to conserve your Sweep Tickets, especially for the early stages. - If the stage was somewhat hard or long to complete, then it's better to use Sweep. Example: On dungeon stages that you can barely complete even with Potions. - Enter the highest stage available for better and higher rewards. - Using Sweep will also increase your chances of getting "Unidentified Items", identify them to receive Grade B or higher gears! I Can't Complete a Dungeon Stage!? - It's ok to use skills, just make sure you have enough Mana for the Boss Map. - Let all of your skills be ready too, before entering a new map. Wait for a while if it's still under cooldown. - Trick: To rapidly increase the CDs of your skills after clearing a map, just [Tap+Hold] your character away from the portal then activate the [Auto-Mode] feature. - Just stand near the entrance and wait for the Boss to come, then spam your Buffs and Active Skills. At later levels, it's sometimes best to clean up some mobs first before chasing the Boss, to avoid too much damage. - If the Boss is too near the entrance, you can use your Buff Skills before entering the Boss map. Buff Skills should at least have around 20 seconds duration though. This is useful if casting buffs in front of the Boss is kinda time wasting for you, and makes you vulnerable from unlikely attacks while casting. - Alternatively, you can also activate 1 Buff Skill right after entering the Boss Map and before your screens pans to view the boss. Just keep tapping the Quick Slot of the skill you want to activate while the screen is loading. 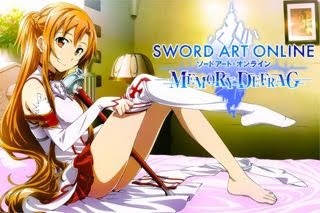 - If you are having trouble, or to increase your chance of surviving the next dungeon stage, better buy some of these. Try to save as many pots as possible for the boss battle. - Use when your HP is below 40%, or just use the auto potion. 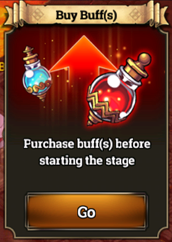 - HP Potions will recover 40% of your max HP, so if you notice that you are running out of potions quick, it's best to add stats like Stamina+ or HP+ on your gears, especially for range characters. - Note: Potions doesn't carry over to the next dungeon run, so use them all if needed. - Max HP +20% is optional, used vs stages with tough bosses. - When fighting higher level monsters, you'll notice that your attacks are being Blocked a lot, this is because of the debuff feature of the game. This time, you might want to increase your Accuracy Stat a little to eliminate the problem. - Get the needed stats from gears or gems, or level up your character more to remove this debuff. - Use Dash (Double tap same location) to move faster or dodge attacks. - Now for Evasion, you might also want to increase your Evasion Stat a bit for added survivability (at least 30% to 40%+ for starters). Every character can benefit from this, especially Magicians, and it can save you a lot of times from deadly attacks! Helps conserve potions too. - Get the needed stats from gears or gems. 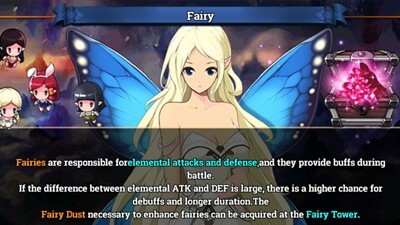 - Well, all characters need some decent DEF stat to survive at least Chapter 9 Normal, even if you prefer HP. I recommended having around 800 DEF for Normal and 2000 DEF for Hero Mode. 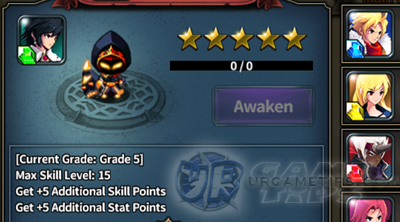 - Get the needed stats from gears (also upgrading Grade Lvl) or gems. - Let's say you already have a nice set of gears, and all stats and skills are good, but you keep on failing a stage, this time, you need to grind to Lvl up your character to upgrade your skills or unlock new skills sets. - Select and grind on a recently completed stage/s that you are comfortable with (with or without using potions). - Grinding places varies per character, and try to find a place that you can use AUTO MODE! - If you don't have any idea what to do next with your gears and stats, you can click on other players (1 or 2 levels higher than you) in town using the same character and build as yours. Check their stats and gear tiers and grades and do the same for your gears and stats. - So, if you are wondering if what Tier your gears should be at, then just check your current level. If for example you are at Lvl 30, then you need to upgrade your gears to at least T5 gears, but T6 gears are the most recommended. I Finished All Chapters, What Now? - Once you finish the Normal Mode, the Hero Mode will be unlocked, then Legend Mode. - If you run out of quests to accept, just continue and grind again once you get stuck.